Last weekend, Strategy Analytics announced that Apple had been surpassed by Samsung in handset profitability, a conclusion arrived at by assuming that Apple's iPhone was bringing in the same proportion of Apple's revenues as it earned in profits. That's not the case. Dediu's figures indicate that Apple's iPhone gross profit margins are an incredible 46 percent, significantly higher than the 36.9 percent margins Apple reports for the overall company. Dediu's report estimated that iPhone accounted for around $7.4 billion of Apple's $9.2 billion in operational profits, leaving just under $2 billion in profit across the rest of its product line. Strategy Analytics' "divide by two" figure attributed $4.6 billion in profits to iPhone and $4.6 billion to iPad, Macs, iPods, iTunes and everything else. A second independent report by Cannacord analyst Michael Walkley estimated Apple's Q2 iPhone earnings at $5.99 billion, with an operating margin of 33 percent. "Operating margin" is what's left over from the gross profit margin (pure profit after subtracting cost of goods from the revenues collected) after you recognize all other operating expenses, including sales and administration costs and the billions of dollars of "CapEx" Apple is investing into equipment, retail stores and iTunes infrastructure. Walkley compares the smartphone operating margins of Apple (33 percent) with Samsung (19 percent), LG (2 percent), Sony & HTC (both at 1 percent), Nokia (a loss; -1 percent), BlackBerry (a loss; -7 percent) and Google's Motorola (a loss; -22 percent). Asymco, Cannacord and Strategy Analytics all agree that Apple and Samsung are the only two healthy horses in the smartphone race. The primary controversial aspect of Strategy Analytics' numbers is its assumption that Apple's iPhone profits are equal to the profitability of rest of its products. At the same time however, Strategy Analytics also reports that Samsung's smartphone profits are wildly out of proportion to the rest of that firm's other businesses, including its TVs and appliances, displays, memory and System LSI chip fab. Smartphones are more profitable, but they are for both companies. Everyone also agrees that vast majority (slightly over 60 percent) of Samsung Electronics' revenues are coming from its IM Mobile group, because Samsung publicly reports this. An even larger percentage (nearly 66 percent) of Samsung's operating profits are reported to come from IM Mobile. That necessarily means, by anyone's metrics, that outside of smartphones Apple is simply destroying Samsung's parallel IM Mobile business (including all of the company's sales of Galaxy tablets, Windows PCs and Chromebooks) in profitability. Strategy Analytics accounts for just $440 million in operational profits after subtracting Samsung's handset profits. Strategy Analytics is, essentially, diverting everyone's attention away from the icebergs to applaud the Titanic for being the first unsinkable ship to make it halfway across the Atlantic. That figure is so tiny that I asked Strategy Analytics Senior Analyst Neil Shah for a confirmation that its handset profit figure for Samsung only counted phone sales. He verified that yes, "the operating profits are with respect to Samsungs mobile handsets (smartphones, phablets, feature phones) only and excludes tablets, PCs, accessories, convertibles, networking etc." Compare that with Apple's non-iPhone operating profit estimates by Cannacord ($3.21 billion) or Strategy Analytics ($4.6 billion). Looked at from this direction, it's hard to understand why Strategy Analytics was focusing attention on its dubious claim that Samsung's handset profits had supposedly come within $600 million of Apple's iPhone profits, while ignoring the corollary conclusion: Apple's iPad and Mac sales were destroying Samsung's entire Galaxy Tab, Chromebook and Windows PC division by a factor of ten, or a difference of $4,160 million. That vast disparity actually seems noteworthy, particularly given the fact that Samsung has been warning its investors all year that its smartphone performance will increasingly be threatened by satiating demand and increased competition. Strategy Analytics is, essentially, diverting everyone's attention away from the icebergs to applaud the Titanic for being the first unsinkable ship to make it halfway across the Atlantic. Even if we use Cannacord's more conservative (and realistic) $3.21 billion estimate for Apple's non-iPhone operational profits, it means that of the only two companies that are profitable at all in smartphones, while Apple is also earning billions on its tablet and PC businesses, Samsung isn't. Samsung had the same problem in matching Apple's blockbuster iPod profits in the early 2000s. While Apple Computer transitioned itself from being a PC maker to being Apple, Inc., with sales of millions of highly profitable new consumer electronics devices, Samsung was already making music playing devices. It just wasn't making similar profits from them. Even joining Microsoft's Android-like PlaysForSure program didn't help. Additionally, nobody issued press releases insisting that Apple's iPod suffered from a falling "market share of shipments" problem simply because there were tons of no-name MP3 players flooding markets in China, although there were warnings that new crops of MP3-playing phones would eat up Apple's iPod sales. What really happened, however, was the opposite. 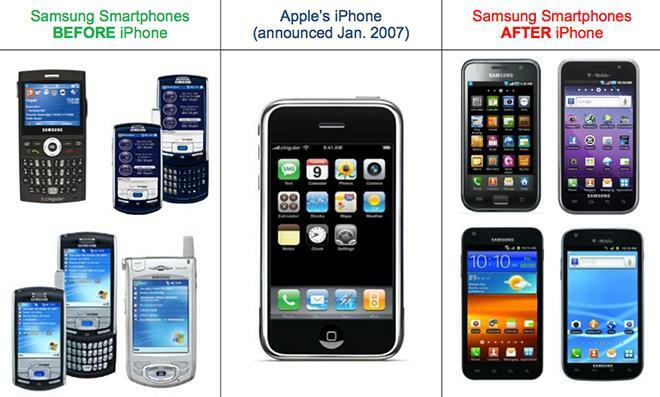 When Apple entered the smartphone market with iPhone, Samsung was already making lots of MP3 playing phones. It was considered a leading smartphone maker. It sold lots of Symbian phones, and in the U.S., Samsung's $500 BlackJack, patterned after the BlackBerry and based on Microsoft's Android-like Windows Mobile platform, seemed to be quite popular. But neither its copycat looks nor its open platform generated profits for Samsung that were remotely comparable to what iPhone began doing for Apple, despite having a nicer camera (albeit no WiFi). 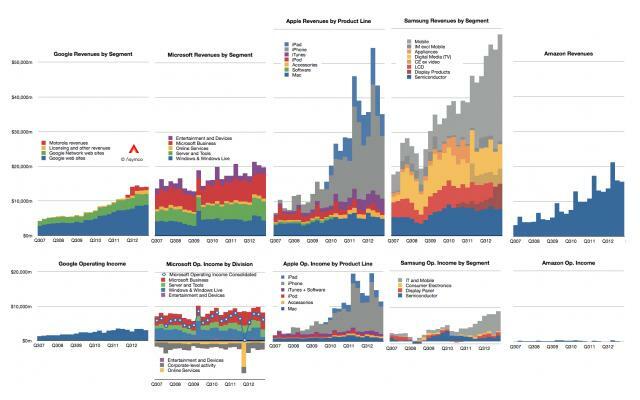 In 2007, Apple's Annual Report cited fiscal year revenues of $24 billion and operating income of $4.4 billion. 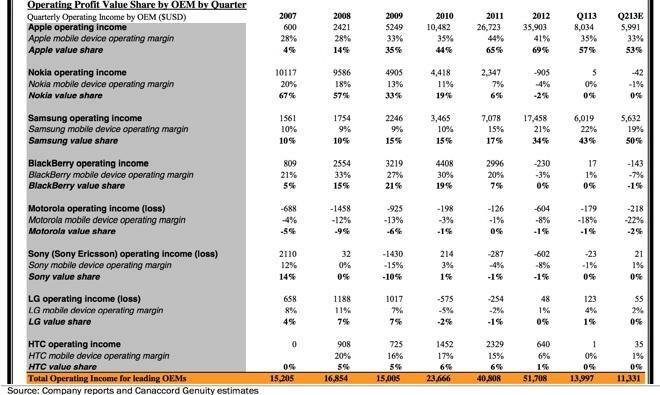 Samsung Electronics reported (PDF) sales of $98.5 trillion Korean Republic Won ($180 billion in today's USD) and $9 trillion KRW ($8 billion in today's USD) in total operating income. Samsung was earning something close to 7 times Apple's revenues, but only around twice its profits. Over the last six years of exploding smartphone sales, Apple has grown to report quarterly revenues of $35.3 billion in its cyclically slow calendar Q2, a multiple of nearly 6 times what it was collecting in 2007. 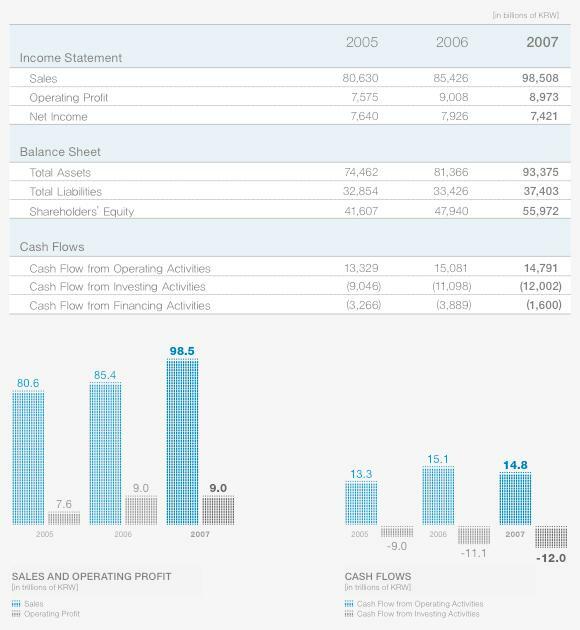 But operating income is now at $9.2 billion, profit growth of more than 8 times over its earlier quarterly average. Samsung now reports quarterly revenues of $57.46 trillion KRW ($51.1 billion) and $9.53 trillion KRW ($8.48 billion) in total operating income. That's revenue growth of just around $6.1 billion and about $6.48 billion in new profit. Nothing to sneeze at, but Samsung is no longer taking in 700 percent Apple's revenues; it's currently pulling just 45 percent more revenue. And it's earning less income: right at 70 percent of Apple's, rather than 181 percent six years ago when the iPhone arrived. The popular narrative of Samsung rapidly growing and taking away Apple's market share in smartphones and tablets is completely backwards. This massive reversal of fortune is evident even when looking at what was the blockbuster launch quarter of Samsung's Galaxy S4 flagship, but the last hurrah of iPhone 5; Apple's nadir quarter following six months of no new iPhone releases, no new iPads, no new iPods, and only one new Mac model. Additionally, Samsung makes (and profits from) a variety of components in Apple's products, including some of the most expensive: displays and memory and the SoC. The popular narrative of Samsung rapidly growing and taking away Apple's market share in smartphones and tablets is completely backwards. Apple has absolutely crushed Samsung in its recent historical smartphone growth, continues to outmatch Samsung in smartphone profits (despite Samsung having far greater carrier distribution and making its own components) and is simply obliterating Samsung in tablets, PCs and everything else. Samsung's leaky firewall, which has allowed Apple's confidential components orders with System LSI to freely inform its mobile group of Apple's every competitive move, has failed to allow Samsung to keep up, and even its methodical, "slavish copying" of Apple since the iPhone 3GS and iPad have not stacked the deck in Samsung's favor enough to restore the once towering edge it maintained over its long term American components client. If the fact that Samsung's entire non-phone earnings from PCs, Chromebooks and Galaxy Tabs only amounts to around 12.5 percent of Apple's non-iPhone profits seems to be a surprisingly well-kept secret, there's even a bigger relevant fact that nobody in the tablet market reporting business seems interested in talking about. While every market analyst and research firm has predicted that tablets will continue to grow as PC sales stagnate or continue to shrink, so far everyone is agreeing that branded tablet shipments have fallen by millions of units over the past quarter. Strategy Analytics, Digitimes and Canalys have all cited total branded tablet shipments for Q2 that were dramatically lower than their Q1 figures. Apple's iPad sales fell from 19.5 million to 14.6 million, but Apple's sales are dramatically cyclical, and the company is gearing up to launch a new crop of iPads after having released no new models since last fall. The drop in tablet shipments by the rest of the industry has no similar explanation. Shipments of branded tablets as reported by Strategy Analytics fell over the previous quarter by 4.4 million. Figures by Digitimes reported a drop of 2.58 million. Canalys reported tablet numbers dropping by an incredible 7.7 million over the previous quarter. That's more shipments than Samsung shipped in Q2! The only figures supporting a quarterly increase in tablet shipments in Q2 are Strategy Analytics' numbers which include that "optional" additional 15.5 million White Box Tablets, a fantastically enormous and completely mysterious increase that neither Canalys nor Digitimes have reported. The most compelling reason for shipments to drop is because the channel is full, the result of too many shipments and not enough buyers. 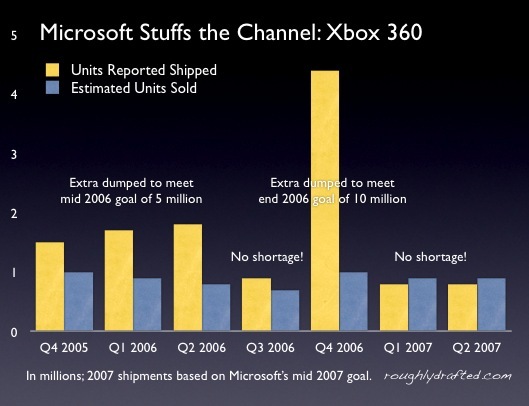 In Q4 of 2006, for example, Microsoft shipped more than 4 million Xbox 360 units in order to meet a stated goal Bill Gates had earlier made for the end of the year. It then shipped just two million units over the next two quarters. It couldn't ship more because the channel was stuffed with inventory. Microsoft clearly stuffed the channel with Surface tablets this year, and has admitted as much. It had to write off $900 million against its other profits in the most recent quarter because the Surface was shipping but not actually selling. Android tablets appear to have stuffed the channel as well, but because no Android vendor actually reports its shipments or sales, it's hard to say how badly any one of them is hurting. That is, of course, why none of them actually report their sales or shipments. The most flattering information any of them can provide is an occasional press release citing shipments of a new model (which sounds good because it takes millions of units to stock empty shelves globally, even if there are no sales), or even more pathetically, the idea that some unknown number of units has "sold out" in a short period of time at a particular retailer. Google sold out of the Nexus 4 last fall, before it was deduced from serial numbers that it had only actually produced just 400,000 units of it over the entire quarter. Microsoft fans hailed both shipments and sell outs of Surface tablets, but it was still a massive flop. While the media focuses on reporting Apple's "lower percentage of tablet shipment share," Apple is not trying to stuff the channel in a race to win a larger "share" of the world's unsold inventory, because maintaining inventory isn't profitable. It's expensive, just ask Microsoft. In fact, as the only vendor that reports unit sales of tablets, Apple also reported that it has allowed its channel inventories to drop during the last quarter. Rather than stuffing the channel, Apple's inventory for calendar Q2 is down by 600,000 iPhones and 700,000 iPads over the previous quarter. As Apple's chief financial officer Peter Oppenheimer stated in the company's earnings call (which also cited the above numbers), "channel inventories declined sequentially by $1 billion during the June quarter." It's as if the media is observing a game of golf and snickering contemptuously at the player with the lowest score. What does Apple know about selling tablets? Apple successfully introduced iPad after Microsoft failed for a decade to launch Bill Gates' pet Tablet PC project. Microsoft partnered with notable hardware leaders, including Samsung and HP, both of whom kept trying new tablet designs each time Microsoft unveiled a new tablet initiative. After the iPad began selling, Samsung focused its efforts on copying Apple's hardware, a strategy that so far has seemed to work in its favor. It is uncontroversial that behind Apple's 14-19 million iPad sales per quarter, Samsung is now world's second largest shipper of tablets. For Q1, IDC pegged Samsung's tablet shipments at 8.8 million, about three times that of third place Asus and nearly 5 times Amazon's fourth place tablet shipments. 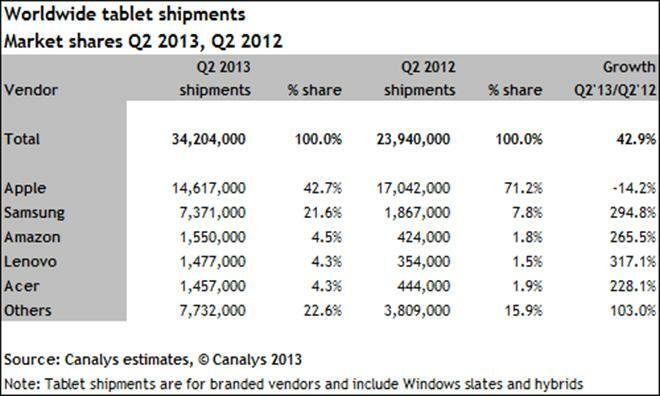 Nobody else was shipping even one million tablets per quarter. For Q2, Canalys says Samsung shipped 7.4 million tablets, over 4.5 times the 1.6 million that it says Amazon shipped, and five times as many as Lenovo and Acer. Unlike Apple, however, Samsung sells a tremendous range of different tablet models, sizes and brands, a strategy that has made its tablets not very profitable at all. If Samsung, the world's largest Android licensee, the most profitable Android vendor overall by far, and the second largest shipper of tablets by a huge margin, is only making $440 million across all of its PC, netbook and tablet sales combined, who else could possibly be making anything on tablets? Asus, which IDC says is the world's second largest tablet producer, reported shipments of 3 million tablets in Q1 (IDC had estimated 2.7 million). Asus makes (and counts) Google's Nexus 7, in addition to its PC, netbook and PC components businesses. But Asus only reported total profits of $202 million for Q1, half the tiny bit Samsung reportedly earned outside of handsets. That's just 6 percent of Apple's "tablets and everything else but iPhone" earnings. Amazon reported total earnings of just $181 million for Q1, and actually lost $7 million in Q2. So again, despite being the fourth largest tablet vendor in the quarter that it did pull a profit, Amazon's Kindle Fire and everything else that it sells, from cloud services to MP3s, eBooks, real books, Amazon Prime videos and Amazon's Android Appstore, all account for considerably less than a tenth of what Apple earned on its non-iPhone sales. Adding in the iPhone is just plain cruel. Microsoft really wants to sell tablets, but multiple sources have reported that the company has sold fewer than 1.7 million Surface tablets over the past three quarters of its existence. Microsoft is, so far, clearly losing money in tablets. So much so that it had to write off $900 million against its other profits in the most recent quarter because of the Surface, less than the total revenue it reported from Surface since its launch. One might think that rest of the tablet industry would strive to copy Apple closer, because what Apple is doing is clearly working, while what everyone else is doing is clearly failing. (Unless you're a fan of fire sales, in which case Microsoft's losses facilitate your shopping sprees). Samsung clearly wants to make money on tablets, but three years into the game of making iPad-like Galaxy Tabs, only 7.8 percent of its IM Mobile profits are coming from a source other than smartphones, according to Strategy Analytics. The strange part is, Samsung should be making more money on tablets than Apple. According to iSuppli's hardware materials cost estimates from last August, Samsung's upscale Galaxy Note 10.1, priced like iPad at $499, cost only $260 in parts, yielding a profit after $10 in manufacturing costs of $229. 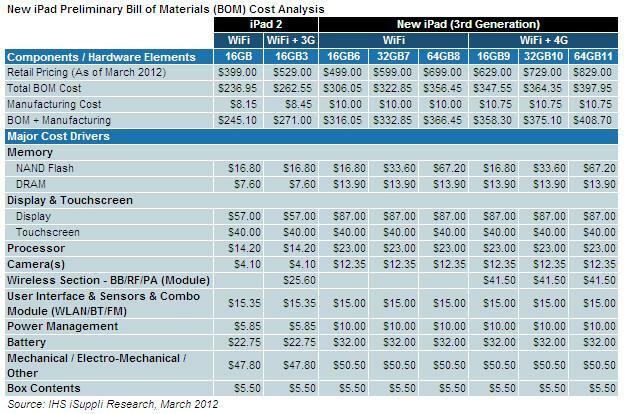 The same firm's bill of materials estimate for last year's similarly-equipped iPad 3 was $316, which with similar manufacturing costs should have only earned Apple $173. "Galaxy Note 10.1 could turn a decent per unit margin for Samsung, and stands to be a money makerif the company can extend the recent success of the Samsung Galaxy Note smartphone to its tablet line," wrote the firm's senior director Andrew Rassweiler. "Samsung is a behemoth in the electronic industry and its competitive strength lies in its control, via internal sourcing, of a large percentage of the components that go into its final products," he added. Yet rather than earning $56 more per tablet, Samsung is shipping half as many tablets as Apple is selling and earning between a fifth and a tenth of what Apple makes, even when throwing in its Chromebooks and PCs, which shouldn't exactly be losing money either. 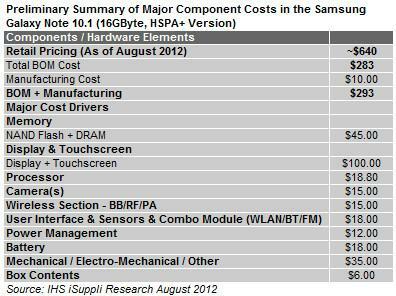 The majority of the tablets Samsung sells must be lower end devices with very little profit margin. If Samsung were making iSuppli's originally estimated gross profits across the 7.4 million tablets tablets it was estimated by Canalys to have shipped last quarter, it should have nearly $1.7 billion in tablet profits to add to its PC and netbook profits, rather than having just $440 million to show for the entire group. However, a larger problem is demand. Regardless of how little money Samsung makes per tablet, it can only make any money if it actually sells its tablets, rather than just shipping them into the channel. And while it's problematic to compare IDC's numbers with Canalys' to track the progress of Samsung's tablet sales over the previous quarter (down 1.4 million if you do), all of the available tablet reports are in agreement that branded tablet shipments are down from the previous quarter, indicating that Samsung's are too. While Samsung, just like Apple, has built an exceptional smartphone business, particularly in markets where phone subsidies allow both of them to offer handsets that appear to be nearly free on contract, tablets typically sell for an upfront price, just like PCs and iPods. Even Apple realized that consumers were not going to sign up for a second expensive cellular contract to "subsidize" iPad sales like a smartphone. Apple sells even its 4G iPads at full price, paired with a negotiated low price no-contract cellular service arrangement with carriers. Samsung didn't think to pioneer any sort of similar deal, despite having been in the Tablet PC market for many years before Apple launched iPad. 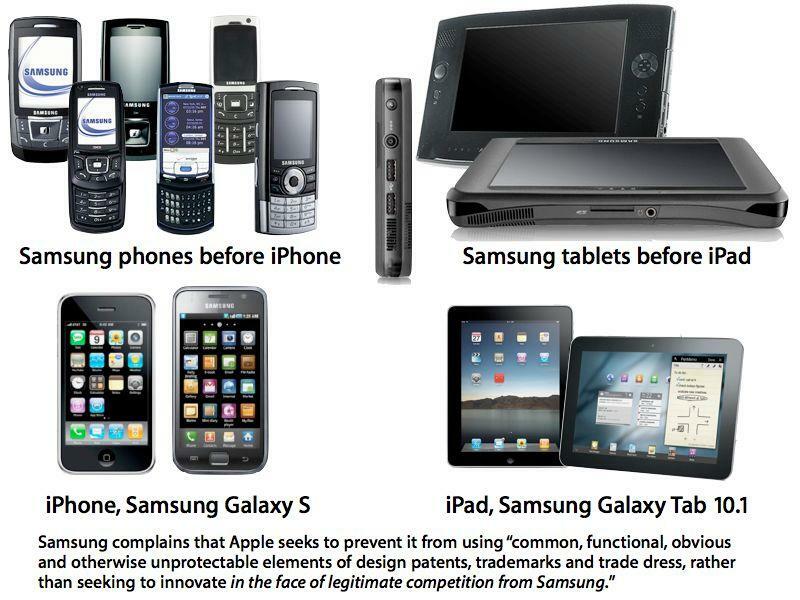 While Apple has convinced vast audiences to buy its other non-iPhone products, particularly iPads, Samsung hasn't. Samsung still makes less money than Apple on sales of twice as many handsets, but it makes just a tiny fraction of Apple's tablet profits despite shipping about half as many. Giving away tablets without a carrier subsidy (bundling them as freebees with a TV, camera or smartphone purchases, for example), which Samsung has been doing on a massive scale over the last three years, has not resulted in the creation of a profitable tablet business segment. 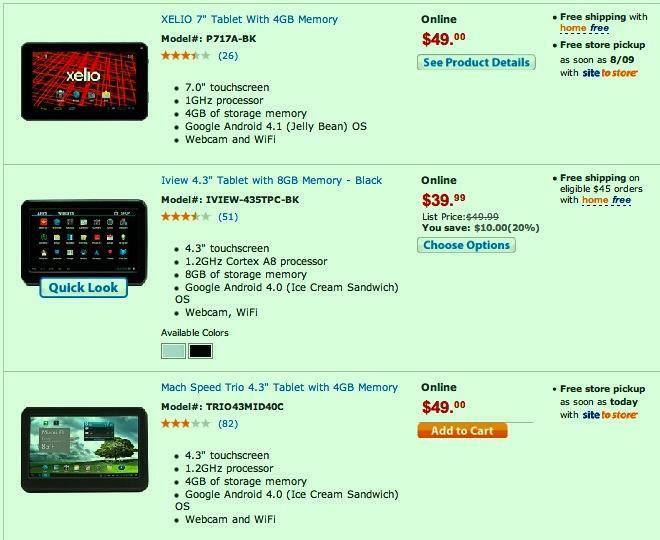 If anything, it has eroded the perceived value of Android tablets. So while Apple may carry a negative connotation among its critics as being "overpriced," Samsung has an even more disastrous reputation among its own customers as being nearly as free as a disposable AOL disc. It's really hard to start charging for something after you have been giving away for next to nothing. How long can the rest of the industry keep losing money on tablets? Microsoft insists it's in the tablet business to stay, but that's the same thing it said about the Zune. Microsoft has billions in revenue and billions in cash reserves, but it stopped building the Zune because losing money is not good business. It's not clear how much (if any) money Apple was ever making selling Xserve, but the company is not making them anymore because they weren't making enough money. Exiting an industry after its profitability collapses is not uncommon. Dell is considering an exit from the consumer PC business because its executives think they can make more money selling enterprise software than they can selling profitless PCs in a market satiated with PC inventory. It's not clear how much (if any) money Apple was ever making selling Xserve, but the company is not making them anymore because they weren't making enough money. IDC counts more "Other" tablets than any brand outside of Apple. Canalys says "Other" is selling more than Samsung. And the only growth Strategy Analytics can see it attributes to White Box Tablets, which represent lots of no-name tablets selling for as little as $75, none of which are anywhere near as profitable as what Samsung is selling. At some point, companies mass producing devices for which there is a finite market will have to stop, just like many of the knockoff MP3 makers did once they realized that it was harder to make money selling fake iPods than they'd realized, or just like Dell exited the smartphone and mini-tablet businesses when it realized its Streak was over. Until that happens, prepare yourself for lots of reports chiding Apple for not stuffing the channel into oblivion with generic junk while it instead relies on organic sales growth as it actually cultivates new markets for iPad. Samsung isn't even the worst offender in shoveling garbage into the channel. There are large numbers of generic tablets being sold, and most of them do use Android. But if anyone thinks this a brilliant, sustainable business model, they need to read up about Atari game cartridges in the 1980s, or netbooks in 2009, or Google TV, or essentially anything that uses Android and isn't a smartphone.